The lich chuckled dryly as the scrying glass showed yet another party of would-be heroes die in one of his fiendish traps. For centuries he had existed in perfect safety within this maze of stone catacombs, a lair crawling with unnatural guardians he had raised from the dead or summoned from the Abyss. Nothing could touch him. The cleric has a vital yet complex role within a party: healer, backup wizard, backup fighter, and a specialist in dealing with the undead. 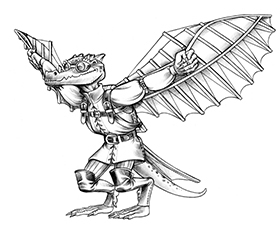 Divine Favor: the Cleric is an invaluable resource to anyone wanting to play one of the oldest character classes in fantasy roleplaying, with many new options for the Pathfinder Roleplaying Game. The book offers 9 new cleric archetypes that bring to life a rich variety of styles one could take advantage of when playing this class. Enthrall others with the power of your words as a charismatic, strike with holy fervor armored only with the power of your faith as an enthusiast, battle the lords of the Abyss for the souls of their wretched victims as an exorcist, or do honor to your god through mastery of its favored weapon as a weapon-sworn cleric. 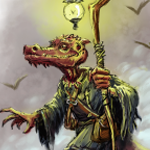 Pick up Divine Favor: the Cleric in the Kobold Store and put the fear of the gods into evildoers! Also check out the other books in the Divine Favor series covering cleric, druid, paladin, and inquisitor. 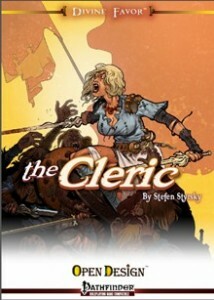 My first character EVER was a cleric. I’m getting this for sure. Yep, same here, a cleric of Thor. I think Stefen did a great job with this one. If you ever decide to make more promo postcards, use the covers from this lineup…fantastic! Thanks Wolfgang! That cover is fantastic, too.